This is my go to place for banh mi! Yes, ever since Nhu Lan opened in Victoria St, I've been going there, abandoning my old favourite Huong Huong, largely because they have the banh mi bi. Nhu Lan is something of an institution in Sai Gon, a bakery/deli with two big outlets. Interestingly, they're one of the few places where banh mi is quite large and chock-ful of fillings, like we're used to here in Australia. Most places/carts tend to be quite sparing with the fillings, and it's more of a snack. It's quite common for men to have two for lunch. Banh mi bi is my new favourite variety, but I am also partial to a banh mi xiu mai though I insist they still put the pate in with it (some places will omit the pate when doing the xiu mai. You also often get bi as a part of your com tam suon bi trung or com tam dac biet (broken rice) so your hunches about its use are completely founded! 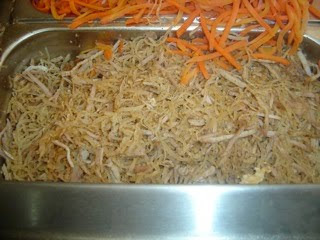 "Bi is usually described as "shredded pork skin". I'd never had it before and was curious." Is this an example of being Bi curious? Penny - it's great, isn't it? I always try new places but keep going back to Nhu Lan. cloudcontrol - thanks for the info. 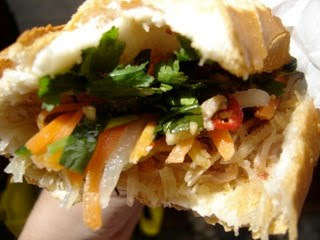 I've never had a banh mi xiu mai, that might be my next breakfast. Tee hee! 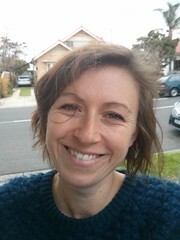 Anon - yep left myself wide open for that one! hehe- what timing. Friends just came back from Nhu Lan and dropped me off a mixed ham roll- how nice is that! Adrian - that's what I call "meant to BI!" Have you try Ba Le? (Straight ahead after the JV Mobile' traffic light, pass the intersection. It's between the Pharmacy and Asian Grocery.) 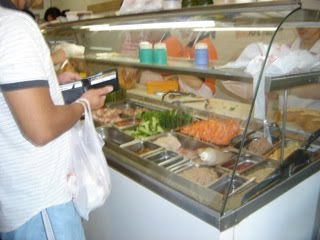 They used to be The Place for pork roll before Nhu Lan came along. I prefer going there over Nhu Lan. They are cheaper and never as busy, very important during the lunch rush. For $3.00 you get 2 flavors (mine is Xiu Mai and Red Pork). 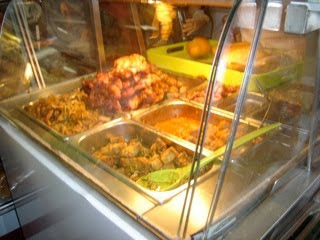 All their hot/cooked food are made in house. Hi Hung, I have tried Ba Le and liked it very much (if you search the blog, you should find the review). I've been wanting to try Banh Mi Xiu Mai for a while now - think Ba Le's version might be next on the list! Thanks for the rec - keep 'em coming! 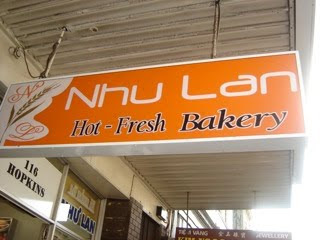 I'm used to like the Ba Le Bakery but I'm now Nhu Lan convert! The bread seems better there. When you bring these baguettes home, a good way to reheat them is to put them straight onto the sandwich press. Hi Mark, that's a good idea. Although Ba Le has nice meat, Nhu Lan has a better overall product. I also think they have the edge in that they bake their own bread onsite. 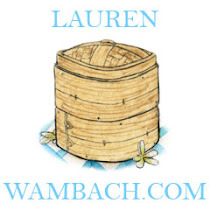 Thanks for doing this write-up! 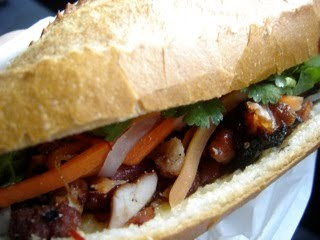 I'm hankering for some Banh Mi.. and since I'm about 45min's-ish away.. I have to make a point of going up for lunch one day. I'll of course have to bring some bread rolls home too. Maria, get the rolls and try making Grandma's chicken curry to serve with it for dinner - search the site for the recipe - OMG to die for! Thank you for that info, anon, and sorry it has taken me so long to write back! That is really interesting. I have always wondered how bi was made as normally skin is rubbery unless it's made into crackling.